Many of us cannot believe it's been 40 years. Four decades ago a war ended in Southeast Asia. It cost more than 50,000 American lives, many hundreds of thousands more were wounded -- some grievously. The nation's soul was injured. This coming April, Panhandle PBS is going to take viewers back through that time. It will show "Last Days in Vietnam," which really isn't about the final days of a nation, but the final days and hours of a war that tore our nation apart. The film is produced by Rory Kennedy, the youngest of 11 children of the late U.S. Sen. Robert F. Kennedy and his wife, Ethel. She's already won acclaim for her documentary work and has emerged as a first-rate historian in her own right. First, a little bit of history about Rory Kennedy. She wasn't yet born when her father was campaigning for the presidency of the United States. RFK had entered the 1968 presidential campaign on a pledge to end the Vietnam War. The man who once supported that action -- while serving as attorney general in his brother's administration -- had grown to oppose it, along with millions of other Americans at the time. He campaigned hard for the White House. On June 5, 1968, Sen. Kennedy won the biggest race of that campaign to date, the Democratic California primary. He stood before the cheering throng in the Ambassador Hotel ballroom, said, "On to Chicago and let's win there," walked into the kitchen on his way to another rally -- and was shot to death by Sirhan B. Sirhan. Rory Kennedy would come into the world several months later. She grew into an award-winning filmmaker. 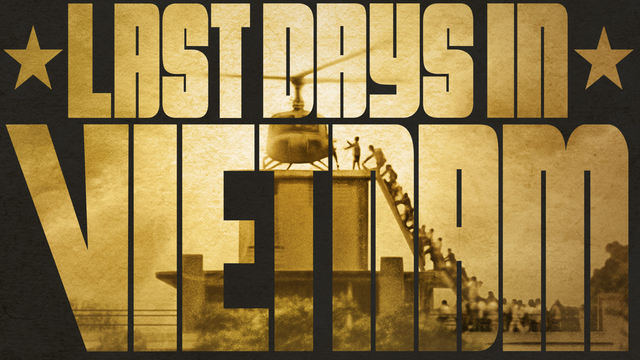 "Last Days in Vietnam" tells of how the United States ended its combat role in South Vietnam, evacuated its remaining troops and then left the fighting to the armed forces of South Vietnam. One major problem emerged: The South Vietnamese military wasn't ready to defend its country. North Vietnam launched an offensive in April 1975, steamrolling through major southern cities. Finally, on April 30, 1975, the North Vietnamese Army rolled into Saigon, captured the government building, raised the communist flag, declared victory and renamed Saigon after Uncle Ho -- Ho Chi Minh. Kennedy's film tells the story of those who were saved and those who were left behind. It goes behind the scenes to talk to those who were privy to the desperate airlift evacuation of hundreds of panicked Vietnamese from atop the U.S. Embassy building in Saigon. We've all seen the pictures. They're heartbreaking in the extreme. The film airs on Panhandle PBS on April 28. I cannot believe it's been 40 years.